Head coach Jeremy Hill talks to the Eastern bench during a regular season game against the Marauders, on February 10 inside Larry R. Morrison Gymnasium in Rocksprings, Ohio. ROCKSPRINGS, Ohio — The Marauders didn’t have to look far to find their next boys basketball coach. 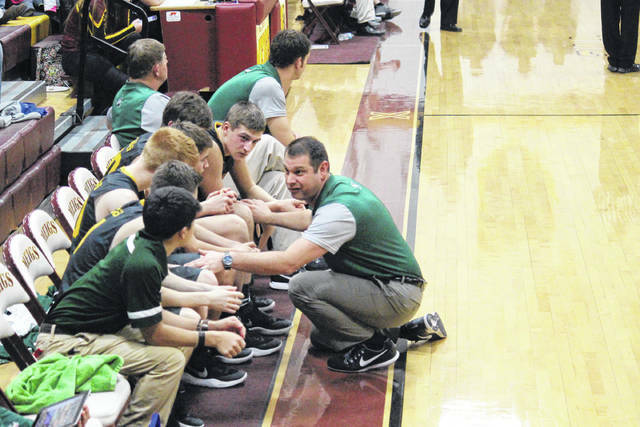 Jeremy Hill — who spent the past five seasons coaching Eastern — was hired as the MHS varsity boys basketball head coach at the Meigs Local Board of Education meeting on May 8. In his five seasons with Eastern, Hill and the Eagles won 29 games, improving their win total from the previous campaign in each of the last three seasons. After just two wins in each his first two seasons at EHS, Hill led the Eagles to six wins in 2015-16, nine wins in the 2016-17 season, and 10 wins last season. A point of pride during Hill’s stent at Eastern was not only the development shown by the Eagles on the court, but outside the lines as well. “I’m really proud of the fact that we never had anybody on our basketball team — whether it be a jay-vee player or a varsity player — not have eligibility due to grades,” said Hill. “Not once did we have to have any strong disciplinary actions. When we went out into the community we were thanked and praised about the way our student-athletes acted a presented themselves. Those things go a long ways in my mind. Eastern had just two players graduate from last year’s 10-13 team. Along with his resignation from the EHS boys basketball team, Hill also stepped away from his duties as varsity golf coach, a position he held for two seasons. The EHS boys golf team was a district qualifier last fall. At Meigs, Hill will be replacing Ed Fry, who resigned from his post as MHS head coach after four seasons and a 52-40 mark. The Marauders won 10 of their final 15 games last season and could return every player from the 10-14 squad, as it featured zero seniors. Last season, Meigs finished fifth in the seven-team Tri-Valley Conference Ohio Division, posting a 5-7 league record. With Eastern last season, Hill didn’t face the top-4 teams in the final TVC Ohio standings, but he’s confident that his players have enough experience in the trenches to help make up his first-year transition a smooth one. One of the early goals that Hill has for the MHS boys basketball program was inspired by University of Kentucky head coach John Calipari. “Twice when (Calipari) took a new job he used the phrase that he wanted to ‘create a love affair for basketball within this community,’ and that’s exactly what I would like to do,” Hill said. “Meigs has been known for football, it’s a football school, Coach Bartrum has done great job with the football program. The baseball program has been outstanding under the leadership of Coach Bissell. The Marauders have already started non-instructional open gym and offseason workouts. Coach Hill will be hosting a meet and greet for players and parents at Fox’s Pizza Den in Pomeroy on Wednesday, June 6, at 7 p.m.